Nice manifold. Seems more sturdy than the swing handle ones I replaced. No leaks and love having 6 lines. Arrived leak free and ready for business. Now I have room for five corny kegs and bottle filler. If I want a different carbonation level I will just prime with sugar. It doesn't leak it does what it's supposed to. I have the 6-way and the 4-way. I just started using my 6-way, but had the 4-way for over a year without leaks are any other problems. I've used this many times since purchase and it has been pretty solid. It is especially nice when used in conjunction with a beer gun as you can just use one source for both CO2 to your keg and the gun. Although I mostly use it to carb multiple kegs at once. If you turn the nozzle too hard it'll leak a bit until you let it go back into it's proper position. Make sure you test the tightness of each individual manifold. It took me a few wasted CO2 tanks to figure the leak was coming from the manifold itself and not the lines or kegs. any way on fixing this? I have had one in use for about a year and a half. I used this in my first keg fridge build. 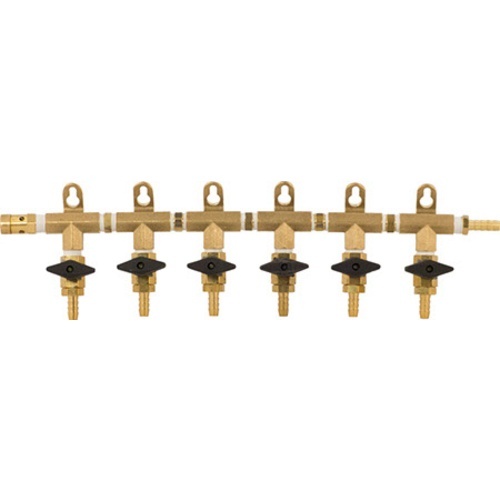 It is reciting worth upgrading to a manifold like this with the one way check valves. Short of spending a few hundred dollars for 6 regulators this was the best and most cost effective way to supply co2 to 6 kegs simultaneously. I recomed this for ease of use and great value for money. This was such an awesome deal and such a great product. Can't say much more other than get it!!! After over 4 years in my kegerator, this manifold is still going strong without a leak. Works great, no leaks, solid piece! Decent Price. Bought this because it was cheaper than other sites for the same features. My local homebrew shop had a 4-way but it was $50+ which is pretty standard. I've had it hooked up for a week or two and so far its been leak and hassle free. I used to just use T's but now I can shut off the serving ports and force carbonate a keg at a higher psi which frees up my second tank. Also, T's are a sanitation nightmare if you get back pressure. I had beer backup into the lines and had to clean them every time I put a new keg on (who wants Imperial Stout in their Wheat Beer?). With this I no longer have to do that. Short of having each tap individually regulated, this is the best way to manage a keggerator.